Bring Electricity outlet into garden (for Xmas tree mainly) from street light pole nearest “the Point” (perhaps via one of the new entrances to minimize construction impacts on Garden plantings). Run water line into the garden (via old Seaman entrance?) & 5 new spigots. (Parks: 4) Hide water meter station. Permanent plantings as needed to replace those damaged in the construction (e.g., perennials & bulbs, sod, small evergreen shrubs, Japanese maple, groundcovers). New pond and waterfalls shaped with a liner rather than a pre-formed shell, towards “the Point”. 3 additional solar collectors and water pump for new and existing waterfalls. 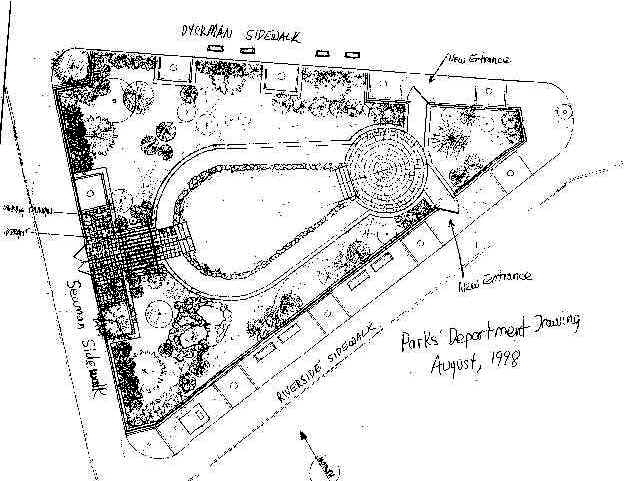 Parks provides ~$5K fund from original allocation for RING to purchase and install these after reconstruction? 3-4 trash / recycling stations on Dyckman sidewalk. Make these cans accessible to Parks’ garbage trucks without them having to drive on sidewalk. Remove Riverside Drive parking meters to permit more sidewalk use. Extend sidewalk back out to preexisting line. Large, self-standing map and legend sign of Garden Plantings for “the Point”. (On reverse of sign: RING History and Volunteer Opportunities). Also, a dedicatory plaque for Messinger, etc., somewhere.